This post is now updated to incorporate the Horror Crossover Encyclopedia, but I have kept the original timeline format. I've already made mention of Jason Vorhees in my blogs regarding Freddy Krueger, Ash Williams, and Scooby-Doo. As always please feel free to leave comments for me on what you thought I missed or got wrong. I really love the feedback, and I do incorporate it in future blogs. And I'll give you a plug. 1667--DEATH MOON--John D Lindsey Jr says: In the Jason X novel DEATH MOON, a character recounts the story of Jebediah Voorhees, a wizard and ancestor of Jason in 1667 Salem, Mass., who possed a copy of the Necronomicon Ex Mortis until he disappeared. This would explain how it came into the possession of Pamela Voorhees, as seen in JASON GOES TO HELL and FREDDY VS JASON VS ASH. January 1758--FRIDAY THE 13TH: BAD LAND--From Wikipedia: The series explores the history of Crystal Lake before Pamela and Jason Voorhees arrived.Bad Land takes place in two time frames, the "present day" and 250 years before "present day". It follows three hikers in the present and three fur trappers in the past, each of whom is snowed in by a blizzard at Crystal Lake. Each group experiences similar events, suggesting that there is a connection between the two groups. 1930--Birth of Pamela Voorhees. Note that my background info for Jason comes from this Friday the 13th timeline. Two alternate timelines can be found here and here. 1935--Camp Crystal Lake is opened. 1945--Pamela Voorhees is marrried to Elias Voorhees. Note that Pamela's maiden name has never been revealed. June 13, 1947--Birth of Jason Voorhees. He is born deformed. 1954--Birth of Diana Voorhees. Diana is Jason's half-sister. Elias is the father of both, but they have different mothers. Diana's mothers name has not been revealed. October 1958--Jason Vorhees drowns in Crystal Lake, due to bullying by his campmates and the neglect of the teen camp counselors at Camp Crystal Lake. June 13, 1959--Two camp counselors are murdered, but the killer is not found. 1960 to 1962--Fires prevent Camp Crystal Lake from reopening. 1963--Bad water prevents the camp from opening. 1972--Jessica Kimble is born, the daughter of Jason's sister, Diana (Voorhees) Kimball. Early June 1979--FRIDAY THE 13TH: PAMELA'S TALE--From Wikipedia: The two issue comic book covers Pamela Voorhees' journey to Camp Crystal Lake and the story of her pregnancy with Jason as she recounts it to hitchhiker Annie, a camp counselor who is killed in the original film. AUGUST 1979--FRIDAY THE 13TH PROLOGUE--Alice, the survivor of the June massacre, returns and finds Jason alive holding his mother's head, and Jason kidnaps Alice. Summer 1982--Chris has a fight with her parents and runs out the cabin, where she is attacked by Jason and passes out. She awakes in her room, and her parents won't speak of the matter. July 10 to 11, 1984--FRIDAY THE 13TH PART 2--Jason Voorhees is revealed to have survived his drowning and may be kept alive by some kind of supernatural means. July 12 to 13, 1984--FRIDAY THE 13TH PART III--Two days later, more teens are slaughtered by Jason. July 14 to 16, 1984--FRIDAY THE 13TH: THE FINAL CHAPTER--Twelve year old Tommy Jarvis kills Jason Vorhees. Sometime after 1984--MOTHER GOOSE AND GRIMM--Jason appears twice. Also note that he has appeared several times in both MAD and CRACKED MAGAZINES. 1985--In an attempt to distance itself from the "Camp Blood" reputation, Crystal Lake is renamed Forest Green. 1985 to 2006--Jason's killing continues in many video games. Summer 1987--FRIDAY THE 13TH PART V: A NEW BEGINNING--Tommy Jarvis, the survivor of the events of 1984, is institutionalized, and finds himself facing off against Roy Burns, an ambulance driver who after losing his son becomes a copycat of Jason Voorhees. 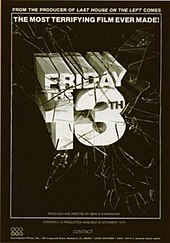 1987 to 1990--THE 13TH HOUR/FRIDAY THE 13TH: THE SERIES--Two cousins must try to retrieve all the cursed objects sold from a cursed antique store. Though the series seems to only be tied to the the movies in name only, in fact there was an intention that the hockey mask Jason wears has some connection to the antique store. May 12 to 13, 1988--FRIDAY THE 13TH PART VI: JASON LIVES--Tommy, who had been institutionalized escapes and goes to Jason's grave to destroy his body, but instead accidentally aids in resurrecting him. 1989--THE RESURRECTION OF MICHAEL MYERS PART 2--At a wild party at a hospital, Michael Myers, Jason Vorhees, Leatherface, and a zombie all show up to cause mayhem. July 28, 1989--THE ARSENIO HALL SHOW--Jason shows up on the set. October 13, 1989--FRIDAY THE 13TH PART VII: THE NEW BLOOD PROLOGUE--Thirteen year old Tina Sheppard unintentionally kills her father with her telekinetic powers. She is institionalized. The Story: Freddy mentors a kid who wants to be a serial killer. Notes: The kid checks out a book from the Springwood Library on serial killers. While it talks about real life killers, it also mentions Michael Myers, Jason Vorhees, and the Sawyer family. 1992--MTV MOVIE AWARDS--Jason Vorhees accepts a lifetime achievement award. The Story: Casey Jones and Raphael save a woman from an assassin, and get involved in her complications. Notes: Jason Vorhees is seen at a diner in New York. Though it’s meant to be contemporary, it would make sense if this story happened during the events of Friday the 13th Part 8: Jason Takes Manhattan. This connects the Mirage Comics version of the Turtles. The film Turtles Forever reveals that every version of the Turtles exists in separate realities in the same multiverse. One of them may be in the main Horror Universe timeline while the other in a divergent timeline. I believe the version from IDW’s X-Files: Conspiracy to be the main Horror Universe version. August 12 to 13, 1993--FRIDAY THE 13TH PART VII: THE NEW BLOOD--A telekinetic named Tina while under duress accidentally resurrects Jason. Mid August 1993--FRIDAY THE 13TH PART VIII: JASON TAKES MANHATTAN--Apparently Crystal Lake connects to the Atlantic, as a cruise ship full of graduating seniors takes off from Crystal Lake to Manhattan. Jason follows, and Tommy follows him. Everyone is killed on the boat by Jason but Tommy and his new girlfriend, who are chased around the city by Jason. The Story: Crystal Lake is drained to place an office building there, and Jason is among the contents shipped to Texas. Jason awakens, and ends up meeting the Sawyers, including the one called Leatherface. Notes: Later stories would show the lake refilled, and no office building there. I suspect that this story takes place in a divergent timeline. First, in this story, Jason’s mother is named Doris rather than Pamela. If that was the only contradiction, I might overlook it, but additionally, by this point in time, as this is a contemporary setting, the Sawyer family of this story have been dead for a long time. This crossover still brings in the Texas Chainsaw Massacre series, based on my rules for inclusion involving divergent timelines. . Though TCM is based on true events, it is so loosely based on true events that it’s pretty much pure fiction, thus able to be incorporated. Many of these slasher films have in recent years had remakes, but only the original film series are in the Horror Universe, up to but not including the reboots. The Story: In Hell, Satan’s Six meet Jason Voorhees. Notes: The Friday the 13th Wiki places this after the events of Jason Goes to Hell: The Final Friday. Satan’s Six is a team of agents from Hell who are sent to Earth to sow the seeds of chaos, but they aren’t very good at their jobs. The team was created by Jack Kirby in the 1970s for what was meant to be his own line of comics, which never came to fruition, until Topps got the rights to them and put out that line of Kirby Comics. This crossover brings Satan’s Six into the Horror Universe. 1994--FRIDAY THE 13TH YOUNG ADULT NOVELS--Different people keep finding Jason's mask, which possesses them when they wear it. January 13, 1995--Stephanie Kimble is born. She is Jason's great niece. Summer 1995--WES CRAVEN'S NEW NIGHTMARE--The dream demons return to their home dimension, that of Earth-Prime. On Earth-Prime, the Nightmare on Elm Street series were fictional movies. In fact, Wes Craven had been haunted by these demons, and found a way to trap them by creating Freddy Krueger. By trapping them in this way, he sent them to the TV Crossover Universe, where they had to help Krueger. But when Craven ended the series, the Demons were no longer trapped, and returned to Earth-Prime, where they haunted not only Craven, but the cast of the first Nightmare film. Eventually, they are trapped once more, beginning with simple act of placing a cameo of Freddy's laugh and his claw at the end of a Friday the 13th film, thus keeping them trapped waiting for the idea of a team-up to come to fruition. Thus the Demons come back to the TV Crossover Universe, and aid Krueger, though he is still at his lowest power point, lacking the fear or the souls to fuel him. 2001--FRIDAY THE 13TH: CHURCH OF THE DIVINE PSYCHOPATH--From Wikipedia: Friday the 13th: Church of the Divine Psychopath has Jason resurrected by a religious cult. 2001--FRIDAY THE 13TH: HELL LAKE--From Wikipedia: In Friday the 13th: Hell Lake, a recently executed serial killer, Wayne Sanchez, persuades Jason to help him escape back to the real world. 2001--HATE-KILL-REPEAT--From Wikipedia: In Hate-Kill-Repeat, two religious serial killers attempt to find Jason at Crystal Lake, believing that the three of them share the same contempt for those that break the moral code. 2001--THE JASON STRAIN--From Wikipedia: The Jason Strain places Jason on an island with a group of death row convicts—placed there by television executives running a reality game show—while a scientist attempts to create an age-retarding "super drug" from Jason's DNA. Instead, she creates a virus that reanimates the dead into zombies. 2001--CARNIVAL OF MANIACS--From Wikipedia: The character of Pamela Voorhees returns from the grave in Carnival of Maniacs, and she searches for Jason, who is now part of a traveling sideshow and about to be auctioned off to the highest bidder. Fall 2002--FRIDAY THE 13TH SPECIAL--From Wikipedia: Siblings Miles and Laura Upland inherit Camp Crystal Lake. Knowing that Jason caused the recent destruction, Laura, unknown to her brother, sets out to kill Jason with a paramilitary group so that she and her brother can sell the property. Late 2002--FIRSTJASON--Ari Lehman creates a rock band called FIRSTJASON. Ari played Jason Voorhees in the first film based on the series of events at Camp Crystal Lake, but in his lyrics, he also reveals that he himself has encountered the real Jason Voorhees. Winter 2003--COLD HEART OF CRYSTAL LAKE--Four teens encounter Jason. The Story: The story of Cassie’s first hunt. Notes: While researching slashers on the internet, Cassie reads of a man who kills in dreams in Ohio (Freddy Krueger of A Nightmare on Elm Street), a masked maniac who terrorizes a small town on Halloween (Michael Myers of Halloween), and a camp plagued for 30 years by a psycho who won’t die (Jason Vorhees of Friday the 13th). She also finds an article about Hellspawn, that includes a picture of Spawn. The Story: Cassie Hack and Vlad fight an undead slasher who controls an army of undead pets. Notes: Cassie Hack is the daughter of a “slasher”, and has devoted her life to fighting them. Thus she has become an expert on them. In this story, she knows about notorious slashers such as Jason Voorhees (Friday the 113th), Freddy Krueger (A Nightmare on Elm Street), and Pinhead (Hellraiser). 2004--MICHAEL VS. JASON--Tommy Jarvis and Jamie Loyd try to set a trap for Michael Myers and Jason Vorhees. June 2005--ROBOT CHICKEN--"Operation Rich in Spirit"--Usually I place Robot Chicken in it's own reality, but this one could fit and should. Mystery, Inc. investigate Camp Crystal Lake and face Jason Vorhees. Of course in the sketch, Jason kills everyone, and that wouldn't be how it would turn out in the TVCU. So the basic premise fits, if not the actual story. Note that the rest of the show is in the Robot Chicken Universe. Note Scooby appears in another episode that is clearly in the Robot Chicken Universe only. September 2005--FRIDAY THE 13TH: BLOODBATH--From Wikipedia: A group of teenagers come to Camp Tomorrow, a camp that sits on Crystal Lake, for work and a "party-filled weekend". The teenagers begin to discover that they share common family backgrounds and soon awaken Jason, who proceeds to kill them. June 2006--FRIDAY THE 13TH: FEARBOOK--From Wikipedia: Jason is captured and experimented upon by the Trent Organization. Jason escapes and seeks out Violet, the survivor of Friday the 13th: Bloodbath, whom the Trent Organization is holding in their Crystal Lake headquarters. The Story: Jason kills teens at camp. What were you expecting? Notes: One of the characters mentions the Milkman Murders from a year ago. The Milkman Murders was a comic book mini series about a housewife who goes crazy and kills her family. August 2006--FRIDAY THE 13TH: HOW I SPENT MY SUMMER VACATION--From Wikipedia: The comic book provides insight into the psychology of Jason Voorhees as he befriends a boy born with a skull deformity. January 2008--FRIDAY THE 13TH: BAD LAND--From Wikipedia: The series explores the history of Crystal Lake before Pamela and Jason Voorhees arrived.Bad Land takes place in two time frames, the "present day" and 250 years before "present day". It follows three hikers in the present and three fur trappers in the past, each of whom is snowed in by a blizzard at Crystal Lake. Each group experiences similar events, suggesting that there is a connection between the two groups. April 2008--FRIDAY THE 13TH: ABUSER AND THE ABUSED--From Wikipedia: The story involves a teenager named Maggie tricking her abusive boyfriend into travelling to Crystal Lake, where she plans to murder him, but she encounters Jason shortly after arriving at the camp. 2008--THE MONSTER SQUAD 2--Ivan Ronald Schablotski says: Gotta be honest, the story of IT using the grown up kids from MONSTER SQUAD fighting Freddy, Jason, Michael, and Chucky, in Amityville, with Ash from Housewares thrown in... plus Romero zombies; I could totally see that happening. One of the rare fan-made movies I'd actually want to watch. 2008--JASON X--Ivan Ronald Schablotski says: Scranton has zombies, as evidenced in DIARY OF THE DEAD (speaking of, today's George Romero's birthday). There was also a secret government installation in Scranton in 2008 to immobilize and study the undying slasher Jason Voorhees, as per JASON X.
July 2008--FRIDAY THE 13TH--More teens are slaughtered by Jason. Even though this is meant as a reboot, in my opinion it fits in just fine as a sequel. Crazy Ivan said... With this in mind, I then put the new F13 movie in that same month (it had to be in the summer, so it should have been before the Feb 09 release), and I assume that the characters Clay Miller (played by Jared Padalecki) is actually Sam Winchester, who is monster-hunting solo that summer while his brother is in Hell. Sam Winchester uses aliases all the time, and his trip to Crystal Lake could have been to find the daughter of a fellow hunter. In the TVCU, same actor / same character would be impossible, but there are a few cases where I still support it. Clay Miller is not likely to be a reoccuring character, and his use as a guise for Sam Winchester allows me to fill in part of the time that Sam was hunting monsters alone, so I support it. The only other example I can recall would be Bill Maxwell, the agent who helped Ralph Hinkley use the super-suit. I feel justified in thinking of Bill as an identity used by agent Kelly Robinson. The Story: While Dexter stalks Jason, Cassie stalks Dexter. Notes: Allie and Seeley created this one page and released it to promote other works. This was never in an officially published comic book nor authorized by any publisher. However, since Seeley is the creator of Hack/Slash, I’d say it counts as canon. Therefore, Dexter is brought into the Horror Universe, but as a non-horror series. Yes, he’s a serial killer, but that alone doesn’t necessarily make the series horror. 2010--ZAAG 3--Five guys are hunted by Jason. 2011--FREDDY VS. JASON VS. ASH FAN FILM--Freddy Krueger and Jason Voorhees team up to seek revenge on Ash Williams. Lucy's haunting nightmares of Freddy resurface as he persuades her to read from the Necronomicon while Jason terrorizes Lucy's friends, leading them to the sacred ceremonial ground. (Is this the same plot as the comic, or an original story, Ivan?) This would mean that the dream demons either returned to the TVCU, or else Freddy no longer needs them. October 2011--THE NIGHTMARE ENDS ON HALLOWEEN II--Freddy, Jason, Michael, Leatherface,and Pinhead. The Story: A creature called the Hodag is stealing jewelry. Notes: The puzzle box from Hellraiser is seen in the sheriff's office and Pinhead’s voice is heard. Jason Voorhees’ hockey mask is also seen in the cabinet of curiosities. Sari Sumdac appears in a flashback. She is a character from Transformers Animated. In the main Horror Universe timeline, IDW’s “steampunk” version of Transformers exists, but apparently in this divergent timeline, Transformers Animated is the version that exists. The Possible Near Future--FRIDAY THE 13TH PART 2--Jason returns to kill more teens. Also in the Possible Near Future--CRYSTAL LAKE CHRONICLES--A group of teens have to deal with living in the town of Crystal Lake, famous for it's slasher, who occasionally appears. January 2017--Ash has another fight against the evil dead...and maybe Freddy and Jason. Then, after that...--JASON X PROLOGUE--Jason is finally apprehended by the government, and they sentence him to death, but find it difficult to carry that out. The Crystal Lake Research Facility is created to house Jason. After studying him, they decide to place him in cryogenic suspended animation. Jason breaks free and kills the staff, except for the project leader, who manages to freeze Jason at the sacrifice of having to freeze himself as well. 2455--JASON X--Jason is found floating in space by a ship full of teenagers on a field trip. He is resurrected and merges with the ship to become a cyborg zombie. 2455--JASON X SPECIAL--Wikipedia: Picking up after the events of the Jason X film, Jason is now on Earth 2 where a bioengineer, Kristen, attempts to subdue him in hopes that she can use his regenerative tissue to save her own life and the lives of those she loves. 2455--FRIDAY THE 13TH: JASON VS. JASON X--Wikipedia: The story takes place after the events of the film Jason X, where a salvage team discovers the spaceship Grendel and awakens a regenerated Jason Voorhees. The "original" Jason and Über-Jason, a version of Jason with mechanical limbs, are drawn into a battle to the death. Me: This one confuses me, because I thought Jason Voorhees was the being that was transformed into Jason X. I think this would have worked better as a time travel story. 2455--JASON X: THE EXPERIMENT--Wikipedia: The Jason X series consisted of four sequels to the 2005 adaptation. The first to be published was Jason X: The Experiment, which saw the government attempting to exploit Jason's indestructibility to create an army of "super soldiers". 2455--PLANET OF THE BEAST--Wikipedia: The second novel,Planet of the Beast, follows the efforts of Dr. Bardox and his crew as they try to clone a comatose Jason and stay alive when Jason awakens. 2455--TO THE THIRD POWER--Wikipedia: The final novel, To The Third Power, is about the discovery of a Jason clone underneath a prison. The Story: When a student needs help with his history paper, he abducts Bill & Ted and makes them take him back to some historical dudes. They take those historical dudes to a mall, just as Bill & Ted once did to pass their own history report. This time, however, they go to a mall in the year 2692. Notes: Jason Vorhees is seen in mall jail. This must be Jason two centuries after the events of Jason X, having still survived. Ted wears an El Santo shirt and mentions El Santo versus the Vampire Women. This could be a pop culture reference, but El Santo is established to have had adventures against the supernatural in the Horror Universe. The mall’s information center is a monolith from 2001: A Space Odyssey. An assassin uses an Acme brand rifle. Though Looney Tunes as seen on the screen is fictional in the Horror Universe, Acme is a real company in the Horror Universe, implied to be the inspiration for the cartoon counterpart. Historical dude George Washington tries to brainwash people using the word “fnord”. This is a reference to the Illuminatus Trilogy. BONGO UNIVERSE--In this reality, as portrayed on FAMILY GUY, Jason Voorhees lives in Quahog. He is very nice, polite, well-mannered and articulate. He is an environmental enthusiast and manages a clothing store. Oh, and he's a psychopathic killer. CHASING JASON--A girl goes on a blind date with Jason. This is a self contained universe. It can't fit in with the TVCU because of the premise. IMAGINATIONLAND--This is the reality where all fictional characters of the Bongo Universe exist, as well as fictional version of real characters. In this reality, the villains are kept separate from everyone else, until the wall is broken and they are set looks. Jason is amongst them. Jason in this reality of effeminate and squeamish. ROBOT CHICKEN UNIVERSE--Jason is part of a slasher version of BIG BROTHER, with house mates Michael Myers (HALLOWEEN), Freddy Krueger (A NIGHTMARE ON ELM STREET), Leatherface (TEXAS CHAINSAW MASSACRE), Pinhead (HELLRAISER), and Ghostface (SCREAM). Note that all of these characters do exist in the TVCU with the exception of Ghostface who exists in the DC Universe. This can't fit in the TVCU due to the ridiculousness of the premise. Jason appears in another episode where we see his typical days on Thursday the 12th and Saturday the 14th. TREEHOUSE OF HORROR--In this multiverse of alternate versions of THE SIMPONS, in one such reality, Jason and Freddy are sitting on the Simpsons' couch waiting for the family to arrive, but they aren't showing up. You are correct that Crystal Lake feeds into the Atlantic, The 1st movie showed that Crystal Lake is very close to Hope, NJ. Hope is in Warren County, so Crystal Lake should be in either Warren or Hunterdon County (Morris County is too inland to be an option). I prefer Hunterdon as the location, personally, but either allows for Crystal Lake to feed the Delaware River, which empties into the Delaware Bay, and then of course becomes part of the Atlantic. So the party boat has to travel around the west, south, and east coasts of NJ... or just head upstream instead, and hit New York that way. As to Jason vs Jason X... Jason X was a cyborg created out of the remains of Jason when he was destroyed onboard the Grendel. 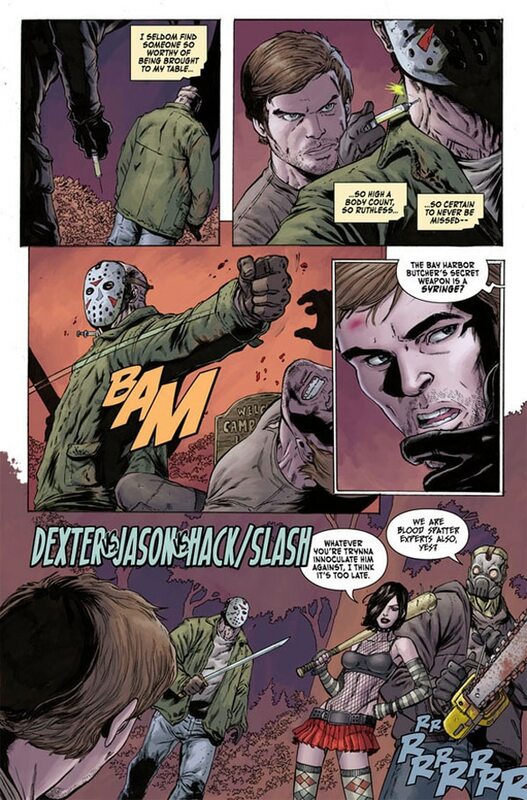 The premise behind the fight is that the REST of the remains of Jason Vorhees eventually reformed and healed on their own, recreating the original Jason. Regarding Ash/Jason/Freddy continuity, the original crossover states it takes place at the height of thei Christmas Season, so it has to be placed in December. There's really no room to play with that, as the only reason Ash is in New Jersey is to help the local S-Mart get ready for the holiday rush. So I place it in December 2007, with FvJvA: Nightmare Warriors happening in July 2008. The second crossover has Jason receive a new, live body, as opposed to the uber monster undead body he's had since F13p4. With this in mind, I then put the new F13 movie in that same month (it had to be in the summer, so it should have been before the Feb 09 release), and I assume that the characters Clay Miller (played by Jared Padalecki) is actually Sam Winchester, who is monster-hunting solo that summer while his brother is in Hell. Sam Winchester uses aliases all the time, and his trip to Crystal Lake could have been to find the daughter of a fellow hunter. The end of FvJvA2 also suggests the creation of a new taskforce to capture / study Jason, which places this story before the capture of Jason by government forces in 2008, as per the prologue in Jason X. Another bit of Jason crossover goodness involves Jason's ancestors, as per the novel Jason X: Death Moon. Elias [Jason's father] is mentioned in the novel Jason X: Death Moon by Black Flame. Here, Elias is described as being little more than a hillbilly, whose great-great-great-grandfather Jebediah Voorhees was a warlock who lived in Salem, Massachusetts and possessed the Necronomicon Ex-Mortis. In the year 1667 on Samhain, the townsfolk living near Jebediah, believing him to be responsible for the disappearance of several local girls, burned his mansion to the ground with him inside, though after the fire no body was ever found. After Jebediah was supposedly killed the Necronomicon was passed down to Elias, who uncovered it one day while searching for kindling. After accidentally using the Necronomicon to summon a demon, which proceeded to possess the then unborn Jason, Elias attempted to use the book to become a warlock himself, with minimal success. The authenticity of this story remains in doubt, as the character who tells the story admits that "that's just one version of what happened". What is the source for Michael vs Jason, and the 2017 fight that may involve Freddy vs Jason vs Ash? Freddy vs. Jason vs. Ash: This came from Wikipedia, based on a film that is more of an idea right now. Several scripts have been written, but nothing that has been satisfactory. I placed in in 2017 based on Sam Raimi's statement that it is several years away from being made. He made the statement in 2010. Several translates to seven when I come up with dates. I actually tried to find the link for you, but it seems all the information about possible future films has been removed. Blurgh. And great information about Jason's background. It will definitely be in my updates next year on both my Jason and Evil Dead blogs. I can't change the date for Freddy vs. Jason vs. Ash (comic) because it's Win's date, and one of my rules is that Win's book is my starting point. The other dates I can move. I changed the dates for Jason X only because it takes place in the (near future), and with other Jason appearances after 2008, that has to push that further into our near future. I'm not one for same actor principle, so it's hard for me to make the Supernatural connection. Knowing now that Jason occupied a new body in FvJvA, makes things more convenient for me with all of the comic and novel appearances. And I see now regarding Jason vs. Jason X. He kind of split into two separate regenerated beings. No idea why Win would place a Christmas story in the Spring, but the fact that it is winter is fairly relevant to the story. Still, this is the TVCU, so your rules, obviously. I can only assume Win did not read the comic itself and simply went by the date of publication. I keep the date of 2008 for Jason's capture intact, becauseJason has already demonstrated the ability to body swap, as per Jason Goes To Hell. Should Jason make anymore canonical appearences, especially ones that do not jive with Jason's original timeline, I will assume that Jason managed to possess a new body while frozen cryogenically. In the TVCU, same actor / same character would be impossible, but there are a few chases where I still support it. Clay Miller is not likely to be a reoccuring character, and his use as a guise for Sam Winchester allows me to fill in part of the time that Sam was hunting monsters alone, so I support it. The only other example I can recall would be Bill Maxwell, the agent who helped Ralph Hinkley use the super-suit. I feel justified in thinking of Bill as an identity used by agent Kelly Robinson. I was already aware of the movie scripts, but it had already been decided by all parties that no FvJvA movie would be coming when they did the 1st comicbook, which was actually adapted from one of the proposed scripts. Yes, there may be a new Evil Dead movie someday, but there will not be a movie with Ash fighting Freddy and/or Jason. Since the date seems to matter to the story, I will change it in future updates. Not the first time I disagreed with the "good book" as Win placed Family Guy in the CU, and I had to think a long time about that before choosing not to place it in the TVCU. And I'm not opposed to same actor principle should there be enough proof. For instance, I think Buffy Summers appears in She's All That, because the school that is not named in the film is the same building used as Sunnydale High, Sarah Michelle Gellar appears in the cafeteria, unnamed, not part of the storyline, and not untrue to her Buffy role, and the film aired when the show was on the air. I certainly will mention the Supernatural connection when I do my updates and when I cover Supernatural. (Actually, you've been giving me a lot of good stuff for Supernatural.) I'll also mention your I Spy/GAH connection when I cover those shows. I like connections with evidence, but as you can see, I also throw in "apocrypha" like potential future projects, fan films, some fan fic, ect. I've even referenced people's speculations. I used Dennis' Immortal Befuddled and Chuck's Children of the Night. And just recently, my Fantasy Island blog covered my own speculations, but also included the speculations of Thom Holbrook and Toby O'Brien, as other possible alternative explanations. It is my rules, but the great thing about that is I can be persuaded to change my reality when there's a good argument. My article on the Talbot werewolves relies a lot on Dennis' and Chuck's works, but it does differ from their findings. Usually when this happens I try to come up with a reason I came to different results than they did, such as new evidence arising, or old evidence disappearing (I used Hurricane Katrina for that one a lot).